In a food processor, finely chop scallions, cilantro, parsley, garlic, and ginger with vinegar and 1 tablespoon oil. Transfer to a bowl. In a large skillet, heat 1 tablespoon oil over medium-high. Season chicken with cayenne, salt, and pepper. Working in batches, cook, turning once, until opaque throughout, 4 to 5 minutes. Transfer chicken to a cutting board; let cool 5 minutes, and thinly slice. Cook soba according to package instructions. Drain; toss with herb mixture. 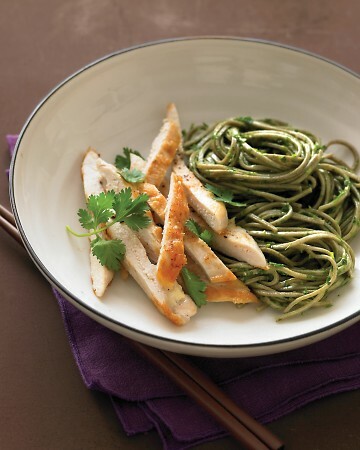 Serve chicken with soba; garnish with cilantro.